BentoLunch.net - What's for lunch at our house: Preschool Bento #39 - We're Going to Finish These Eggs if It Kills Us! Preschool Bento #39 - We're Going to Finish These Eggs if It Kills Us! I think this was Monday's snack bento for Mr. Ben. It's the last of the boiled eggs, so it couldn't have come at a better time. We just had too many in the house and I think everyone could use a break from them for a few weeks. But since they can't go to waste if they are already cooked, lucky Ben got the last one! 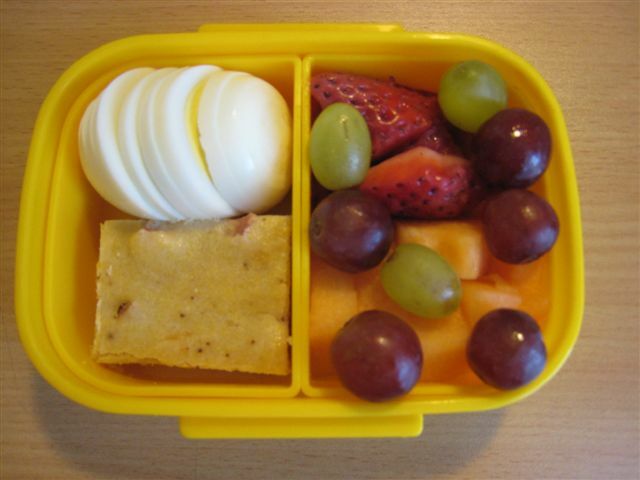 Mr. Ben had the last boiled egg, a cornbread square (think corndog muffin but a loaf pan and with homemade bread mix), purple & green grapes, strawberries & cantaloupe. Fruit makes the boy happy. I need to use all my eggs too!